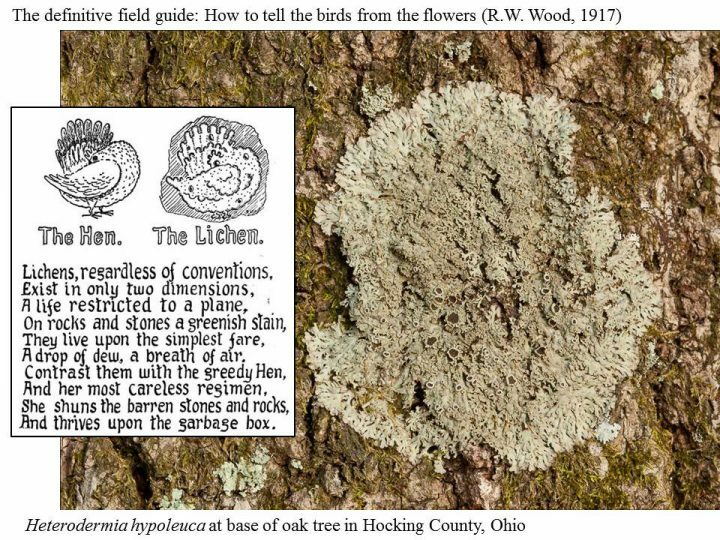 Lichens have been called “fungi that invented agriculture.” Fungi, of which other, non-lichenized, examples include molds, mushrooms, and morels, are more closely related to animals than they are to plants. Thus, instead of producing their own food by photosynthesis as plants do, fungi need to “eat” something. The body of most fungi consists of pale, hairlike filaments called “hyphae.” Hyphae are the organs fungi use to acquire food, either by secreting extracellular digestive enzymes and then directly absorbing the digested food (mushrooms do this), or, as in some parasitic and symbiotic fungi (including lichens), by using special absorptive hyphae to adhere closely to, surround, or even directly enter the cells of other organisms. In both molds and the underground portions of mushrooms, the hyphal strands are loose and sparsely arranged (recall what happens when strawberries sit too long; the white strands you see are mold hyphae). Often, however, hyphae are packed tightly together, forming a firm, macroscopic (visible to the unaided eye) complex structure such as a toadstool, a bracket fungus, or a lichen. A drawing of a thin cross-section of a typical foliose lichen thallus (as the body of a lichen is called) seen through a microscope shows its distinct internal organization, with a clear stratification into functional zones. The skin-like outer surfaces, composed of firmly compressed cells, are the upper and lower cortex. Most of the area between the upper and lower cortex is occupied by a loose, cottony tangle of hyphae termed the medulla. Sandwiched between the medulla and the upper cortex, where sunlight and moisture can penetrate, is the thin but crucial algal layer. This is a colony of single-celled photosynthesizing organisms, typically green algae, which are “farmed” by the fungus. Rhizines are frequently found on the lower surface. 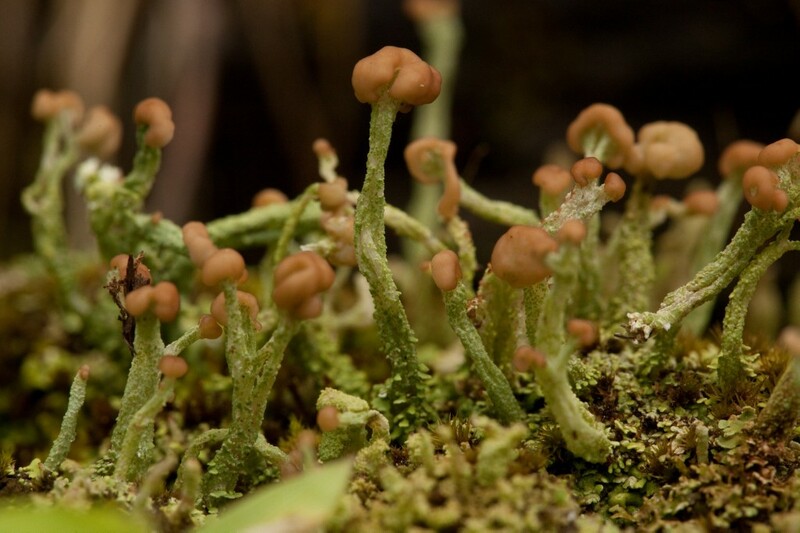 These are tiny hold-fasts that resemble roots and anchor the lichen to the substrate. They can be simple (unbranched) or branched in several different ways. Lichen reproduction and colonization can occur in two ways: the production of sexual spores, and through some sort of asexual fragmentation. Spores are microscopic, single cells that can develop into entire new multicellular organisms. The fungus group to which the great majority of lichens belong, the phylum Ascomycota, are sometimes called “cup fungi,” because the specialized spore-producing hyphae (the asci) are packed together in a neat little button-shaped cup, the “apothecium.” (Ascomycetes are also called “sac fungi,: after the sac-like asci withing which the spores are produced.) Spores released into the air can be blown to a new place where they germinate and start a new fungus. This new fungus must immediately find the correct species of alga to form a new lichen, or it dies. Some lichen algae can live independently but no lichen fungi can. This may seem haphazard, but some lichens are quite successful with this method of reproduction. 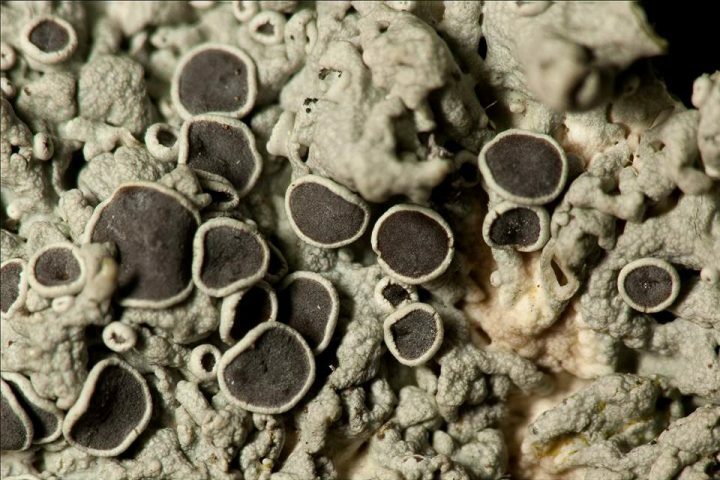 Below, see a photo of a apothecia on a typical foliose lichen, Physcia stellaris. 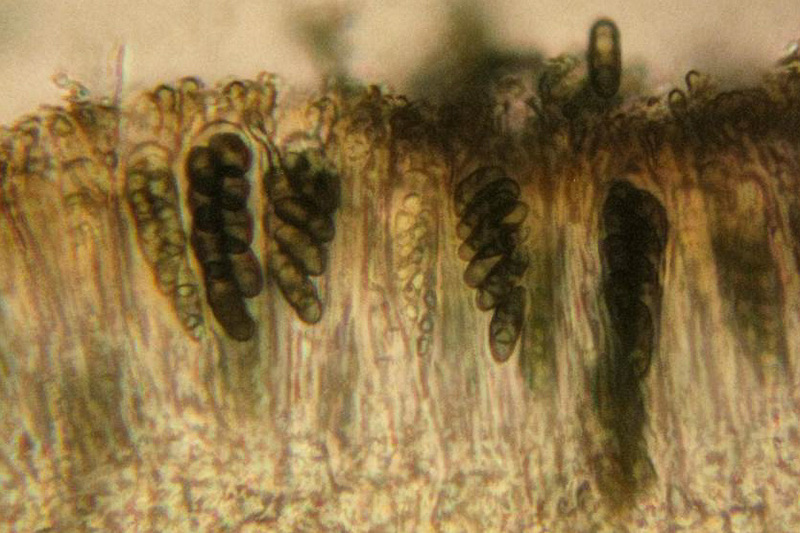 A microscopic cross-section of an apothecium shows the characteristic feature of ascomycete fungi –the sac-like spore-containing asci. 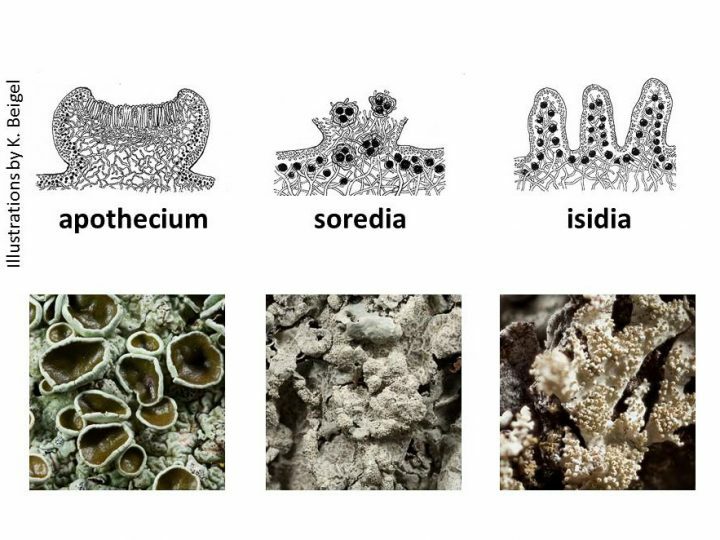 Most lichens that reproduce through asexual fragmentation will be either sorediate or isidiate, not a mixture of the two. They may, however, also have apothecia and produce spores. Some lichen species are neither sorediate nor isidiate; these types are most likely to have abundant apothecia. Soredia are powdery masses of fungal hyphae mixed with algal cells that burst through openings in the upper cortex. A somewhat less common, but by no means rare, asexual propagule is formed from isidia. Isidia are small buds that form on the upper surface of lichens that contain both the upper cortex (fungus) and algal layer. These generally tubular or stump-shaped projections eventually break off from the lichen’s surface, leaving a microscopic scar. 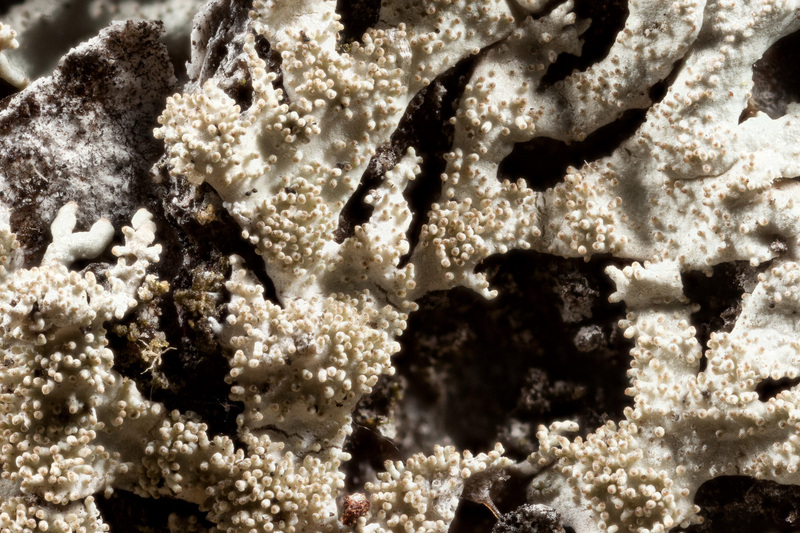 Using a hand lens, a lichen with isidia can usually be distinguished from one with soredia by having a bumpy yet shiny surface, (shiny because the cortex is intact). Isidia are small surface outgrowths of the upper surface of a lichen which break off to form new lichens. Crustose lichens are thin and very tightly attached to the substrate on which they grow. They frequently grow in a circular pattern and can be no thicker than a coat of paint. 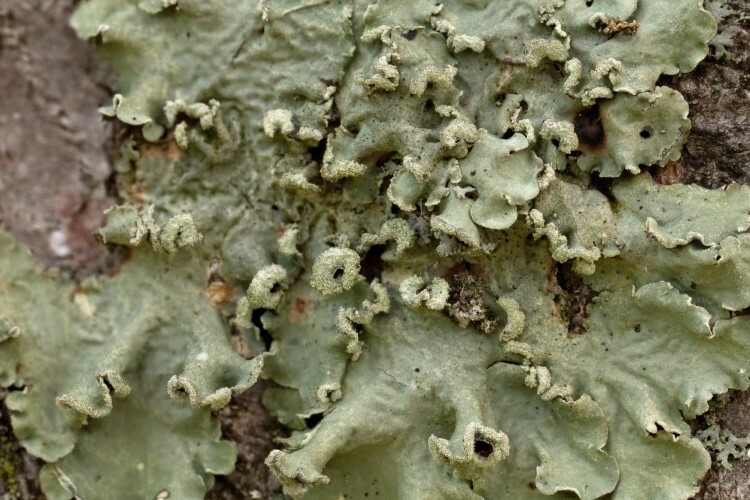 Most crustose lichens are stratified in a top-to-bottom fashion, with an upper cortex, algal layer, and medulla, similar to that seen on foliose lichens except that there is no lower cortex or rhizines. The medulla sits directly on the substrate and in many instances actually penetrates the rock or bark it is growing on. 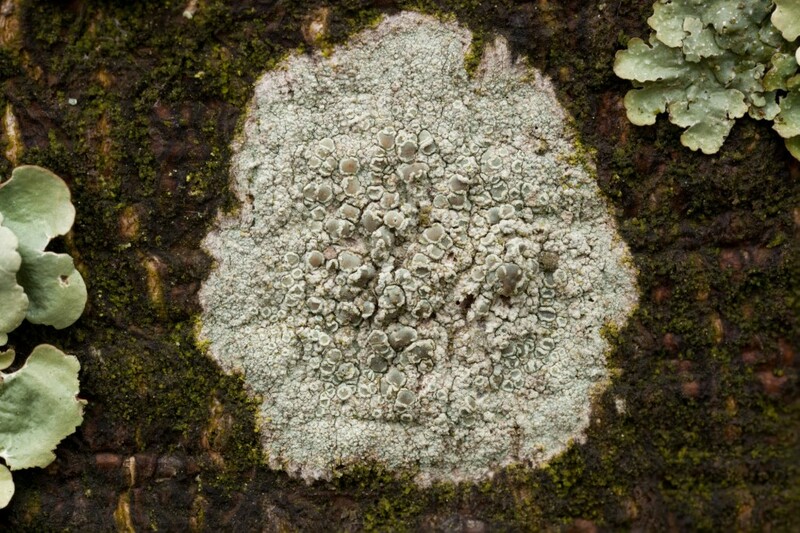 Because crustose lichens do not have a lower surface it is nearly impossible to separate one intact from the substrate. Lecanora hybocarpa is a crustose lichen. Foliose lichens are flat and leaf-like. Growth occurs at the outer margin and is usually in a circular pattern. Areas of faster growth produce lobes which may be large or small depending on the species. Some species of foliose lichens may grow together, coalescing into large indistinct patches. Some foliose lichens lie very flat on the substrate while others may have edges that curl above the substrate. Most foliose lichens are stratified into four layers: the upper cortex, algal layer, medulla and lower cortex. This is similar to the layered tissue arrangement exhibited by crustose lichens except that the lower cortex, which is a distinct bottom to the foliose lichen, is not found in crustose species. The lichen shown below, along with a quaint old woodcut, is a foliose lichen. Fruticose lichens are upright like tiny trees or bushes, or they can hang down like a miniature vine. Fruticose lichens are long and skinny with a round or flattened cross section. They have an outer cortex, algal layer and medulla, but not a definite top and bottom like their foliose cousins. The center is sometimes hollow or can have a more dense central strand. 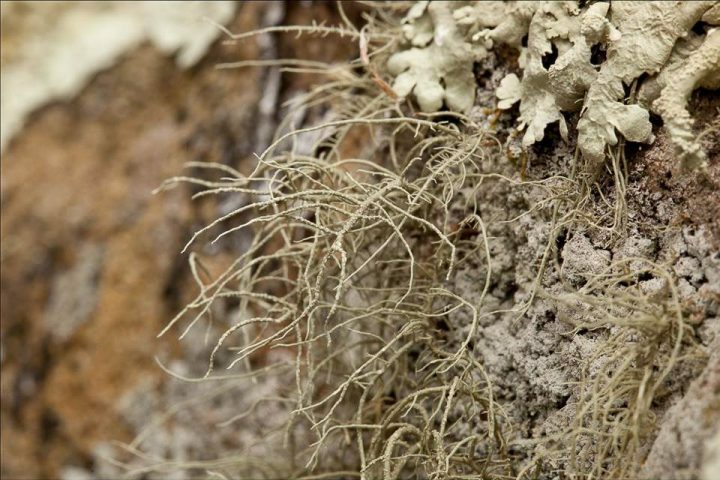 Beard lichen (genus Usnea) is a fruticose lichen. 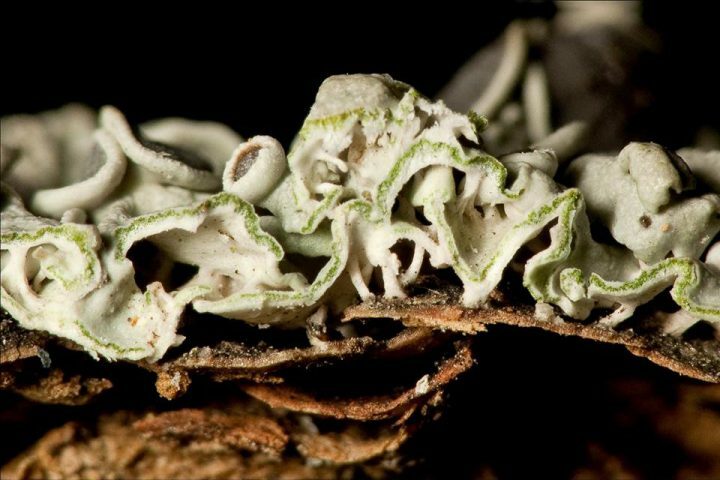 There is a large group of fruticose lichens that are called “cladoniform.” These consist of two parts: a primary thallus which is the first thing to grow and is usually crustose or formed by numerous small plates called squamules, later followed by an upright structure called a podetium. Since most members of the large and important genus Cladonia, are cladoniform, this is the most common type of fruticose lichen in Ohio. Turban lichen is a clodoniform fruticose lichen. Turban lichen is a cladoniform fruticose lichen. 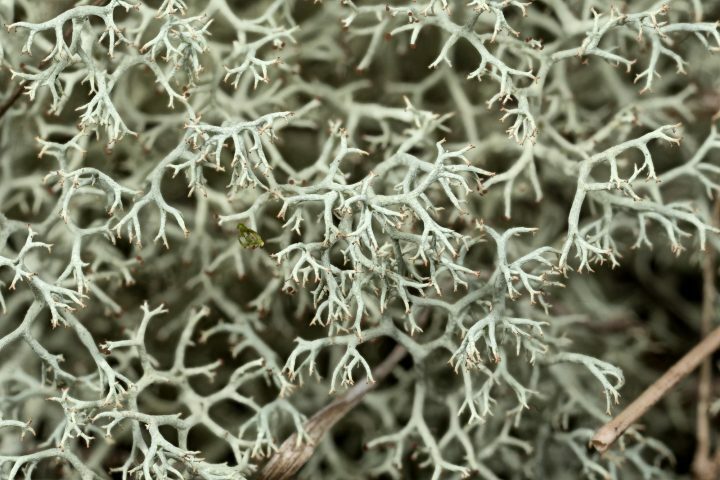 A variant of the cladonifom body is found in “reindeer lichens,” i.e., several species of Cladonia. Several members of the genus Cladonia are reindeer lichens. 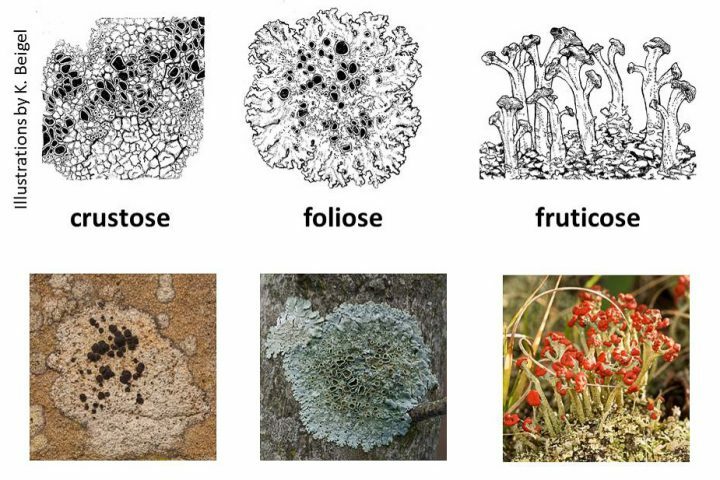 The foliose and fruticose lichens are called macrolichens because they are generally easy to see without magnification. The crustose lichens are sometimes called microlichens.